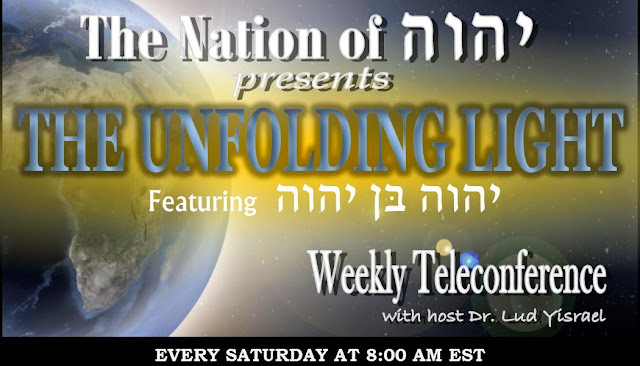 We are most thankful to our Father יהוהfor yet another opportunity to unfold the light today on the Unfolding Light. The broadcasts for today and last week have been made available for dial-in access. To listen to this recording by telephone please dial 1-712-432-3131 and enter the appropriate recording ID when prompted for it. It can also be accessed from our website at http://theunfoldinglight.blogspot.com/. We offer up the highest Praises to our Father יהוהfor another opportunity to unfold some light on the Unfolding Light. The broadcasts for today and last week have been made available for dial-in access. To listen to this recording by telephone please dial 1-712-432-3131 and enter the appropriate recording ID when prompted for it. It can also be accessed from our website at http://theunfoldinglight.blogspot.com/.